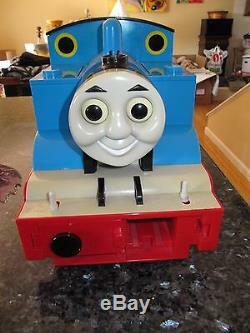 BIG Thomas (Original 1998), missing 3 doors (no tracks or other accessories); battery operated, stop/go flip switches, choo choo whistle, eyes move. 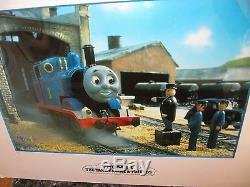 "Made by TOMY 1998; Britt Allcroft (Thomas) 1997" printed on underside of train. Face lifts up for storage of trains and/or tracks. Top flips up for storage. Other doors open for storage of trains and/or tracks. Length: 19 3/4, Height: 9", Width: 7 7/8". 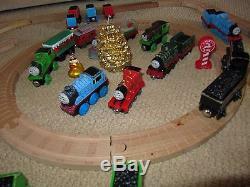 Vintage and rare metal trains of early characters. Authentic episode Cell (Thomas, Sir Topham Hat, 2 engineers). 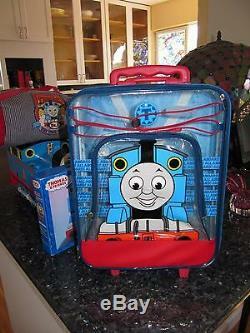 Thomas rolling luggage with see through front pouches. 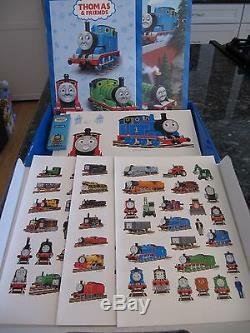 Thomas Funkit crayons, stickers, punch out trains, 2 coloring books (1 missing). 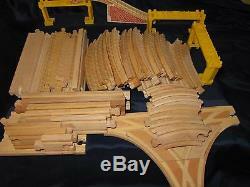 Tracks (46 straight and curved wood tracks), 3 plastic trellis', 1/2 of bridge, Triangle switch track, Double wide track. 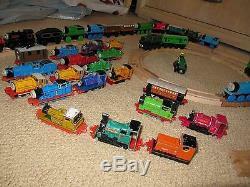 Trains: Wood, Metal, Plastic, Battery operated, linked metal; 36 wood trains (tender included), 19 Metal (tender included, magnetic), 18 (tender included, metal with plastic links), Plastic battery operated10 (tender included), Harold the Helicopter, Bertie the Bus, Bulgy railway bus, Pugwash submarine (soft plastic). MOST of these trains are dated 1980's, and 1990's. 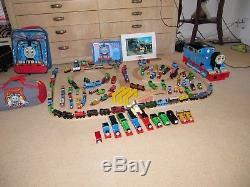 The metal trains (small) have been heavily played with. The classic wood trains are a mixed bag; some are like new, others are heavily played with. The battery operated plastic set is LIKE NEW. The Christmas tender, and snow covered trains, as well as chocolate covered Percy are like new. TRAINS (wood/magnetic): Peter Sam, Derek, Percy chocolate, Percy, Duck, Boco, Rickety, Winter caboose, Percy, Lady, Salty, Splatter, Arthur, Duke, Trevor, Harvey, Dodge, Frank, Donald+tender, Donald +tender, Douglas+tender, Catherine, Emily+tender, Wilbert, Sir Handel, Henry+3 tenders, Annie, Edward+2 tenders, Thomas, Thomas, Thomas, Skarloey, Skarloey, James +2 tenders, Sodor Cargo Co tender, Toby, Duck, Gordon +tender, Sodor fuel magnetic. TRAINS (Metal, magnetic): Percy small, Percy large, Henry, Henry +tender, Duck, Bill, Ben, Murdoch +tender, Thomas, Thomas happy holidays tender, Diesel 10 w/ broken arm, Thomas large (snow covered), Thomas small (snow covered), James, Spencer +tender, Emily +tender, Diesel, Edward, Gordon +tender. 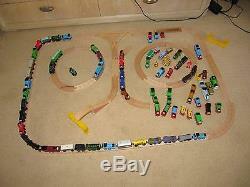 TRAINS: (Metal, linked): Ertyl #11, brown passenger train, #3 blue? , Thomas, Thomas, Duck, Edward, James, Ben, Ben, Bill, Peter Sam, Skarloey, Godred, Rusty, Stepney, Toby. TRAINS (Battery operated, hard plastic): Henry+tender, Edward+tender, Gordon+tender, Duck, Bill, Ben, Thomas, Percy, Diesel, James, Bulgy Railway Bus, Thomas with loader (have extra battery pack that fits this, but it's not attached). TRACKS: 3 styles: Straight tracks (18), Curved tracks (46), 1/2 bridge, 3 plastic trellis, Triangle switch, double wide track. MISC: Harold the helicopter, 3 cake toppers for Birthday (Thomas, Thomas, Percy), Milk tender (plastic, link), 4" Percy & Annie (hookups), Annie 3 1/2 hook type link, 2 3/12" dining? 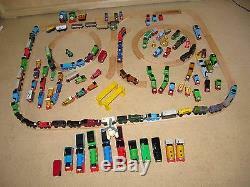 Cars, 1 wood "reindeer crossing' 2 1/4", Plastic dome Thomas go round (not working). 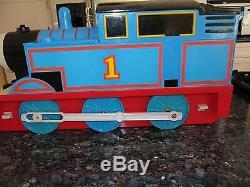 The item "Thomas the Tank Engine ULTIMATE collection of Rare, Vintage Trains, Tracks" is in sale since Tuesday, August 29, 2017. This item is in the category "Toys & Hobbies\TV & Movie Character Toys". 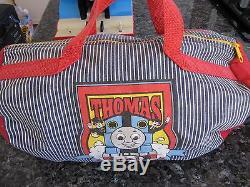 The seller is "fionas_treasures200" and is located in Novato, California. This item can be shipped to United States, Canada, United Kingdom, Denmark, Romania, Slovakia, Bulgaria, Czech republic, Finland, Hungary, Latvia, Lithuania, Malta, Estonia, Australia, Greece, Portugal, Cyprus, Slovenia, Japan, China, Sweden, South Korea, Indonesia, Taiwan, Thailand, Belgium, France, Hong Kong, Ireland, Netherlands, Poland, Spain, Italy, Germany, Austria, Bahamas, Israel, Mexico, New Zealand, Philippines, Singapore, Switzerland, Norway, Saudi arabia, Ukraine, United arab emirates, Qatar, Kuwait, Bahrain, Croatia, Malaysia, Chile, Colombia, Costa rica, Panama, Trinidad and tobago, Guatemala, Honduras, Jamaica, Antigua and barbuda, Aruba, Belize, Dominica, Grenada, Saint kitts and nevis, Saint lucia, Montserrat, Turks and caicos islands, Barbados, Bangladesh, Bermuda, Brunei darussalam, Bolivia, Egypt, French guiana, Guernsey, Gibraltar, Guadeloupe, Iceland, Jersey, Jordan, Cambodia, Cayman islands, Liechtenstein, Sri lanka, Luxembourg, Monaco, Macao, Martinique, Maldives, Nicaragua, Oman, Pakistan, Paraguay, Reunion.